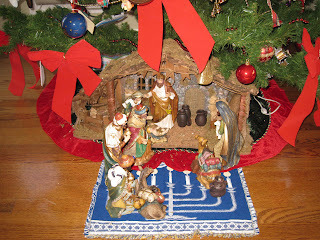 As we celebrate the holidays – Chanukah and Christmas, we tend to contemplate on the year that passed. every wrong turns that we freak out about! Is it the bright golden sparkles that grace the green branches? Is it the gold trimmed red ribbons that adorn the tree? Is it the unique hand-crafted ornaments that rings a bell? Is it the sparkling ballerina or the dainty crystal horn? Is it the manger that your 8yo put together? Is it the joyful and soulful sound of Christmas carols? Is it the icicle light bulbs that hang around your front patio? Is it the angel made of bamboo that’s sitting on top of the table? Is it the different Santa collection you’ve gathered for the past fifteen years? Is it the snowman in soft cushion or white ceramic? Is it the stocking that’s resting on a hoder on top of the mantle? Is it the light that goes on at dusk and off at dawn? Is it the smell of pine cones and pine garland that’s wrapped around the banister? Is it the poinsettia that sits on the floor? 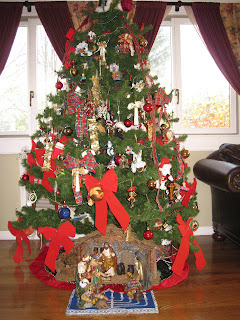 Is it the red and gold bows that dominate the tree? Is it the family Christmas card you send out to family and friends? Is it the busy traffic of frantic bargain shoppers at the mall? Is it the cake, the pie, the roast, the lamb – that grace your dining room table? Is it the sweet voice of a child waiting for hear Santa’s “Ho-ho-ho” ? Is it the warm chocolate coupled with warm hugs and kisses from a love one? Or is it the silly conversations with family and long lost friend? Or is it the hymn of angelic choir at the midnight mass? Or is it the elegant dresses, fancy jewelry and shoes? Or is it the red and white wine, sound of champagne glasses? Or is it the children patiently waiting to open the presents? Or is it remembering the families far away from home? Or is it the warmth of a love one pressed against your skin? Or is it the fact that ...a Child is born, three Kings came looking, followed the star and offered gifts? Whatever it is, enjoy the holidays! Remember why we celebrate Chanukah and Christmas, and cherish every moment! The nativity scene is a perfect reminder of what Christmas is all about. People get so distracted with so many things, forgetting the Best Gift that came. Have a blessed Christmas. God bless. RCUBEs, thanks for the visit - and may you have a blessed Christmas, too..and yes, God Bless you and your family! Happy holidays to you and yours. Hope to see you back more regularly in the new year. Beautifully written - it brought a smile to my face and tears to my eyes.